Explore two lives—and a relationship—that profoundly shaped American Zen. Ruth Fuller Sasaki and Sokei-an Shigetsu Sasaki: two pioneers of Zen in the West. Ruth was an American with a privileged life, even during the height of the Great Depression, before she went to Japan and met D. T. Suzuki. Sokei-an was one of the first Zen priests to come to America; he brought the gift of the Dharma to the United States but in 1942 was put in an internment camp. One made his way to the West and the other would find her way to the East, but together they created the First Zen Institute of America and helped birth a new generation of Zen practitioners: among them, Alan Watts, Gary Snyder, and Burton Watson. 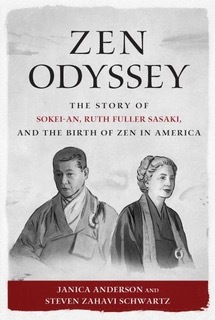 They were married less than a year before Sokei-an died, but Ruth would go on to helm trailblazing translations in his honor and to become the first foreigner to be the priest of a Rinzai Zen temple in Japan. With lyrical prose, authors Steven Zahavi Schwartz and Janica Anderson bring Ruth and Sokei-an to life. Two dozen intimate photographs photos show us two people who aren’t mere historical figures, but flesh and blood people, walking their paths. "A fine book and a good read as well. It was a pleasure for me to see this story presented accurately and with insight into Zen."